Winnie the Pooh is one of the most beloved literary characters in the world, but the story of his creator, A.A. Milne is less well-known. Told even less is the story of the boy who inspired Pooh's tales, Milne's son Christopher Robin, who wasn't so much a fan of all the attention that came with his father's success. Goodbye Christopher Robin is an unusual entry in the "story about storymakers" genre that has seemingly replaced the creation of actual new stories, in that it's not so fuzzy and warm as a Finding Neverland or Saving Mr. Banks, but shows the dark side that comes with instant fame. Directed by Simon Curtis, who previously explored the personal toll of celebrity with My Week with Marilyn, the film gives off the warming glow we've come to expect from so many of these handsomely-made biopics about children's book authors. 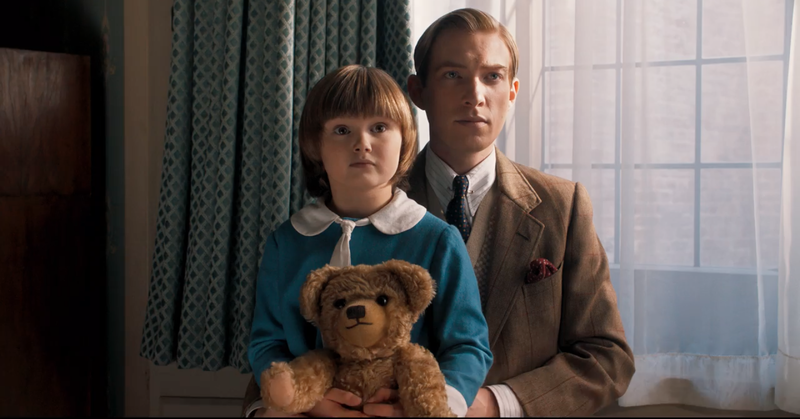 But Milne (played by the ubiquitous Domhnall Gleeson), freshly returned from the horrors of "the war to end all wars", hardly seems like the man to create the lovable Pooh bear. He's angry at the world, distant from his socialite wife Daphne (Margot Robbie, somewhat miscast), and unsure how to act around their precocious son, who they've taken to nicknaming Billy Moon (Wil Tilston, later played by Alex Lawther). Later on his nickname would be handy in separating their son from the fictional boy who had adventures in the Hundred Acre Wood with Pooh and Co.
Having moved out to the Sussex countryside to get away from the bustling city (Milne returned home with what we now know as PTSD), Milne set out to write an anti-war treatise that nobody wanted to read or publish. But when he's left alone with his son after Daphne flees back home and the nanny (Kelly MacDonald) has gone on extended leave, Milne begins to see the vast forest surroundings through Christopher's eyes. It becomes a place of wonder, of magical creatures, of hidden corners where echoes ring out, and there's that giant, twisted old tree that would become the setting of so many Pooh stories. Much of the film is about recognition of the influences that inspired Milne to create Pooh and his many friends. A hive of honeybees for that silly ol' honey-loving Pooh bear; a Canadian black bear at the zoo inspires the name Winnie (short for Winnipeg), and so forth. And of course, all of Christopher's stuffed animal pals became Tigger (because it sounds better than "Tiger"), Eeyore, and the rest. Those aspects, the "revelations", will be catnip to fans of the jolly ol' bear, but the awkward relationship between Milne and Christopher Robin is the film's heart. The opening scene is a case of narrative misdirection, implying a final "goodbye" to an older Christopher sent off to fight in WWII. Everything that follows is rendered surreal and sentimental as a result, those moments between father and young son might as well have been captured in golden amber. They take on a remorseful tone later on, after the boy asks his father to write a story for him. That story becomes Winnie the Pooh, which goes on to become world famous, and thus no longer belonging to Christopher at all. It must be shared with the world's children, and so must Christopher who is paraded off from one photo shoot to the next. Everyone wants to know the real Christopher Robin and every kid wants to be him, while secretly he is hating every moment. There's an interesting bit where Milne angrily notes that it's the author who is supposed to become famous, but all anyone cares about is his son. The irony being that Christopher doesn't feel as if anyone truly cares for him at all; he's just there to sell more books. Milne isn't painted as a bad guy by any stretch; and there's no crime in being unsure how to raise a child. Coming across less favorably is the flighty, opportunistic Daphne whose only real concern seems to be staying in the spotlight. It's not a particularly good role for Robbie, either; as Daphne is gone for long stretches and when she does return she's a little suffocating. It's another fine turn for Gleeson, though, depicting Milne's PTSD respectfully (As respectfully as jumping at loud noises can be), his awkwardness at fatherhood, and growing anti-war sentiment. There is a deeply humanist thread that ties all of the story's various elements together, and I wish it could have been delved into more fully. As it is, there's something holding the film back from being as emotive as it should be. Maybe it hews a little too closely in style and stuffy manner to similar films to stand out as it should. That said, it's hard not to shed a tear when you realize the real-life boy who was Christopher Robin never saw the same happiness as his fictional counterpart, or that Winnie the Pooh gave to millions of others. Don't worry, Goodbye Christopher Robin won't lessen your love of Milne's work. It may cause you to love Winnie the Pooh all the more to know what Milne and his family were willing to sacrifice to bring him into our lives.